Today’s Job Openings and Labor Turnover Survey from the BLS came in significantly stronger than expected as the number of job openings came in at 6.939 million versus estimates for a level of 6.675 million. Based on this report and reports over the last few months, 2018 is shaping up as a year where economists have underestimated the strength of the US job market. To illustrate, in the each of the JOLTS reports covering 2018 so far, all seven of them have come in better than expected, beating expectations by an average of 219K! In the chart below, we update the spread between the number of Job openings in the US to the number of unemployed. 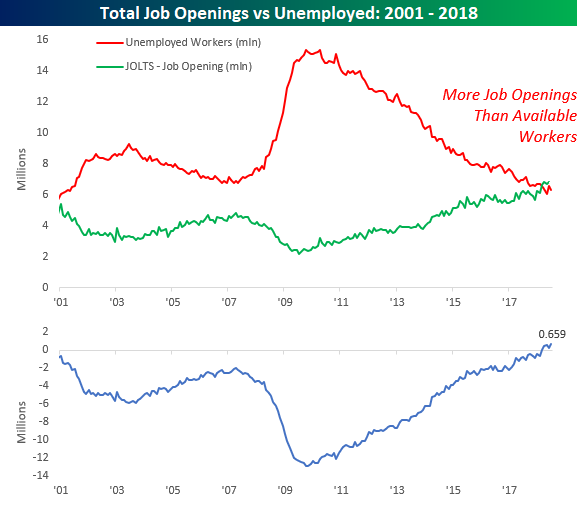 You may recall that back in March the number of job openings exceeded the number of unemployed for the first time since the data for the JOLTS survey begins in 2001. Since then, the gap between job openings and available workers has continued to widen. Through July, which is the most recent available data for the JOLTS survey, the gap stood at a record 659K. Earlier on Tuesday, the NFIB Small Business Optimism Index showed that small businesses are increasingly having trouble finding available workers and the latest data from the JOLTS survey confirm the tightness of the US labor market. These days, available jobs are like shooting fish in a barrel.